But emerging drone technology is helping solve that critical shortfall in times of humanitarian crisis. The very same unmanned aerial systems (UAS) that are making headlines for same-day delivery can provide valuable services for aid workers and others on the ground. From accessing areas that vehicles simply can’t reach to more safely entering unsound structures, here are four ways UAS technology can provide a helping hand with disaster relief. Step one following any disaster is to assess the current situation to best determine the next steps – determining who needs immediate assistance and where. But in remote areas where roadways are questionable before disaster hits, following a crisis, simply accessing these locations can be a monumental challenge. Enter drones. With unmanned flights that can soar above any wrecked infrastructure, first responders and humanitarian missions can quickly and easily identify damage such as toppled buildings, obstructed roadways and fallen infrastructure, as well as locate potential survivors. Such was the case in Utah, where late last year, flash floods swept through the cities of Hilldale and Colorado City. The Utah Division of Emergency Management deployed drones to survey where the floods started, assess damage and even access restricted areas where helicopters and other means of transportation weren’t usable in the past, such as tight river channels. Dispatching fleets of emergency responders via helicopter or land vehicles costs precious resources, particularly in times when lives might hang in the balance. Sending out a UAS to survey an area requires minimal personnel, and it can be done in a matter of minutes following a disaster. With UAS in use, emergency employees can also realize incredible budget savings. Per Utah Division of Emergency Management spokesperson Joe Dougherty, the Division purchased a drone for $2,200, which requires little to no maintenance costs. But helicopter missions – whether to survey damage, search for survivors or other emergency tasks – can cost upwards of $4,000 an hour for each deployment. In April’s flood, the ability to fly into previously inaccessible areas using a UAS instead of a helicopter saved time and money and afforded the Division critical information that they wouldn’t have otherwise had. While drones can’t rescue people (yet), helping to pinpoint key areas of interest more quickly with UAS technology can potentially help reduce costs for each mission and reap dramatic savings for budget-conscious municipalities and emergency response teams. Using a single operator, aid organizations, emergency management operations and law enforcement departments can quickly observe damaged areas, like those left unsteady following April 2015’s earthquake in Nepal, without endangering other lives. Flying over ravaged landscapes, drones collect GPS coordinates, real-time video and still images of the damage, helping first responders set priorities back at mission control. This data can be overlaid on area topography and maps using operational intelligence (OI) technology to show specifically where and how the landscape has shifted, as is often the case with powerful earthquakes, floods and other natural and manmade disasters that can decimate identifying landmarks. This insight is invaluable for crews tasked with determining where to set up key access points to the area, locating and rescuing survivors and identifying critical needs for those who are still in the vicinity. In addition to getting into tight spaces like the flood channels in Utah, drones and other unmanned vehicles are ideal for deployment in areas that might not be safe for humans following disasters. Post 9/11, unmanned ground vehicles were sent into the rubble to search for survivors in buildings that lacked structural integrity. Similarly, cases of arson, earthquakes, tornadoes and other emergencies can severely alter a building’s integrity and affect the ability of first responders to enter and assess damages. Using unmanned vehicles, emergency crews can gain unprecedented access to these areas without putting personnel at risk, with the added benefit of recording the encounter and collecting additional data. UAS are also being used to measure radiation in nuclear power plant accidents because they can fly lower than manned operations without risk of exposure. 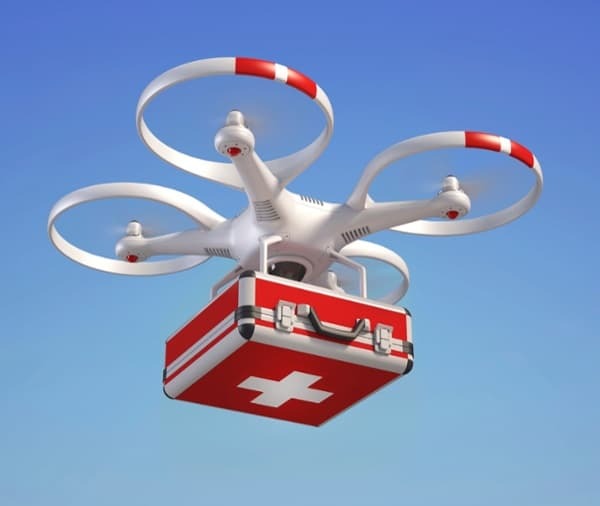 UAS adoption is rising rapidly, and while we hear stories about drones and their potential to make our lives more convenient, we shouldn’t forget that UAS also stand to have a dramatic impact on saving lives during times of disaster and helping those affected return to life as normal as quickly as possible following a crisis.